WHEN Ebow Quansah President of SWAG was confronted by Ms Eva Otchere of Joy FM Sports about the Sports Writers Association of Ghana President's politicisation of the SWAG his reply to the accusation was that because he is a political animal he cannot help making statements devoid of politics. I could not believe what I heard, but had to bow down my head in utter amazement and disbelief at the lame excuse he gave. People like Ebow Quansah and others with like mind should know that SWAG does not belong to any political party and as such we should be spared that kind of foolish talk. Who doesn't know that it was Joe Aggrey and other NPP people who lobbied to put Ebow Quansah at the helm of the SWAG? Everybody knows, so nobody can fool us. No wonder, this is what Ghana has come to for a psuedo politicians like Ebow Quansah, to be running around flexing his muscles like a Mr Ghana, macho-man. The President of SWAG continued his rantings on that faithful day 23-10-04, to the effect that "if it had been in Rawlings time, Mr Kwame Bamfo a.k.a. Sikkens could not have built the ALISA II HOTEL. What a liar! For Ebow Quansah's information, the first Hotel called ALISA I was built at Labone-East Cantonment area few years back in the late 1990's and has since been completed and functioning. Of course it was during the Ex-President's time. Prior to that feat, Mr Kwame Bamfo had built by the old Fadama Road, near the Agbogloshie Market, a giant paint factory to cater for both the automobile and housing industries but, Rawlings did not put any stumbling block in his way, so what is Ebow Quansah talking about. The man, Ebow, just doesn't have the facts. He is just being devious and contakrous. My humble advise to the SWAG President is "Stop this cheap politics and desist from demonising Rawlings because he who God has blessed no one can destroy with lies and calumny." 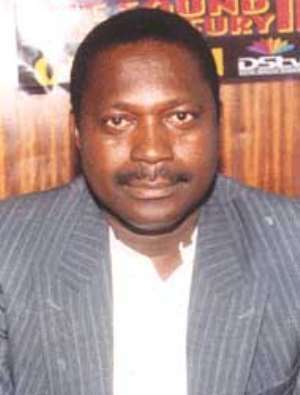 In my estimation Ebow Quansah is suffering from delusion of grandeur. He sees himself as a political Hercules with some journalistic clout. He is none of the above, because here was a man who was a nobody in the early 1980's. He attended a work-shop or a short course in Europe from where he vanished into thin air. After he resurfaced from the under ground (the usual Ghanaian tactics when he/she travels to Europe or America), he claimed a refugee status. So, why all the noise?